These cookies are addictive, spicy little packets of goodness and the most important ingredient, is of course, Hae Bee Hiam. I was lucky to be given a bottle of home-made dried prawns, ground and fried with sambal chilli, but you can either buy it (at Toast Box in Singapore, I'm told) or else make your own with the recipes here and here. This recipe comes from my own baking guru, who formulates and tests recipes until they just fit. This is a really easy one, essentially a sable butter cookie with the hae bee hiam added in right at the end. 1. Cream the butter and sugar together till pale yellow and fluffy. Beat in the eggs, one at a time and then the vanilla. 4. Cool and store in an air-tight container. These cookies are best eaten warm! To all our faithful, wonderful readers, we wish you a very happy and prosperous New Year. May the Year of the Snake bring you all your heart's desires, good health and many successes. Dong dong dong chiang! Dong dong dong chiang! Recipe: Chinese New Year Pineapple Tarts, The Best Recipe Ever! By far my favourite thing to do for Chinese New Year is to bake pineapple tarts. The reason I like this is just because home-made tarts are the best. Also, to stamp out the tarts kind of neccesitates sitting around the kitchen table for a fair period of time, which is great for bonding. The recipe for this is very simple and very, very good. You have to make the pastry dough first because it has to chill overnight (I've given the dough recipe in the previous post). This recipe is courtesy of my Peranakan aunts, who make flawless home-made New Year goodies and this recipe really does receive lots of compliments. Or maybe home-made pineapple jam is just one of those modern day luxuries. Each year, I use about 8-9 pineapples and the secret to this jam is to chop the pineapples up by hand. If you blend it into a food processor, you will cut all the fibres and the jam will have less flavour and no body. That's why store-bought jam disintegrates in your mouth and never gives the luscious mouth-feel of a home-made or artisanal jam. The jam is an easy if tedious recipe. Get your fruit seller to slice the skins off the pineapple and choose dark yellow, sweet pineapples with a good nuanced flavour. It doesn't really matter how many pineapples you use, as the jam recipe is scalable. The recipe calls for 6 but I use 8 or 9 because I don't like to have remainder dough afterward. Now, although I said to hand-chop all the pineapples, you can blend up to a third and chop up the rest, it will have the same effect. Mash up the remnants and chase all the juice and the pinapple from your chopping board into a pot. You should get something similar to what is pictured in the photo above, loose smashed pineapple. Use about half the amount of sugar to pineapple (measure with the same bowls you used for the pineapple). I generally put Less than half and that works out for slightly not-so-sweet tarts. Throw in the cinnamon and cloves, about 4 or 5 cinnamon sticks in each pot and a handful of cloves in each. I like to use more spices-pineapple tarts are usually so sweet, I like to make mine a little less sweet and with a complex and deep fragrance and flavour. Boil on high heat till all the pineapple jam warms through and then lower to a simmer for a couple of hours. You will know when the jam is done, because it changes colour slightly as the sugar caramelizes, the jam turns from a light or medium yellow to an almost orangey colour. Also, it becomes thicker and the juice starts to evapourate and the cinnamon sticks unfurl. You can cool and refrigerate the jam overnight, or else just wait for it to cool sufficiently. This is what the jam will look like after being cooked for over 3 hours, a beautiful caramelized amber, dry, slightly stringy, thick and packed full of deep fruity goodness. When making the jam, be careful that the sugar has not all sunk to the bottom of the bowl and started to burn. You need to stir it throughly for the first half hour to distribute the heat. If the bottom of your jam Has burned, do not stir the burnt bits through- remove the jam to a clean pot, leaving the burnt pieces at the bottom of the first pot and begin the heating process again, in the new pot. To assemble, just take your cookie stampers and stamp out the tarts and line them up on a silpat, or a parchment paper-covered tray. Some people like thicker tarts and some like thinner ones. The advantage of doing it yourself is that you can dictate exactly what sort of tarts you get! Then roll large and generous balls of jam and sit them in the center of the tarts, flattening the tops slightly. Remove the cloves from the jam when you come across them and decorate the tops of the tarts if you like with some spare dough strips or cloves. This is the part of the process that is very repetitive and which you can do without thinking; perfect for chatting across the dining room table. Brush the pastry with egg yolk and bake in the over for 20 min at 140C. Don't overbake them as the dough will get dry. If you need to, you can lower the temperature and move the tray up toward the fan to dry out the jam. These are heavenly when warm and just out of the oven! I brought a freshly-baked tray out to dinner and it's amazing how quickly them little fingers move to grab the tarts! You can also cool them, stack them and store them in prefably air-tight containers between greaseproof paper as they dent more easily then the harder store-bought tarts. It only begins to feel like a Chinese New Year, when I start the process of making pineapple tarts. Even though it's tedious, there's something cathartic about it, like the slow shedding of a year into the next, with the stamping of each tart. I always try to involve friends in this process, not just because it helps with the workload (hehe) but because it's such a good way to sit and talk for awhile. I find that I have to find new pineapple victims every year though because most of my friends have wised up to my schemes. This year, I was privledged to have M. and S. come by to help with the stamping and filling of tarts. I had already made the jam, as described in previous posts here and here and S. asked for the recipe for the light and crusty dough, so here it is, in pictures. There are subtle differences between this recipe and the previous ones linked for pineapple tart dough, that's becuase over the years I've refined my proportions somewhat. Step 1: Chop up 2 1/4 blocks of cold unsalted butter (250grams each) and add it to 1kg of sifted plain all-purpose flour. I try to use a European butter like President, Lurpak or Elle et Vivre, given how much butter goes in! For the flour, I use a regular Prima flour, I have used some premium brands before but don't really find that it makes that much difference. Add a pinch of salt. Step 2: Rub the butter into the flour until it resembles breadcrumbs. If you start with small pieces of butter, or even grated butter, this will be a much easier process but I'm usually too lazy. Your butter should be cold though, to make it easier to slice up and to prevent the dough from melting into a soft lump. Step 3: Add 4 egg yolks and 1 egg white, beaten together lightly, 1 1/2 Tablespoons of ice-cold water and the juice of 3 limes. I like to freeze a shallow bowl of water before I begin making the dough, then remove it to thaw after I've rubbed in the dough. This ensures that the water is really ice cold. Step 4: Mix well into the batter. This is also where, if you like, you can add 1/2 teaspoon of vanilla essence or vanilla seeds for the taste. Step 5: Try to knead the dough as little as possible, stop as soon as it all adheres together, to prevent a tougher texture. Step 6: Divide the balls of dough into 4-5 seperate pieces. Step 7: Flatten the dough within clingwrap. This makes it easier to store, to freeze (the dough can be frozen for 3 months and if you are intending to keep it raw for more than 3 days in the fridge, you should freeze it) and then to roll out (still within clingwrap) then stamp, neatly. Sometimes to be a good baker or cook, you have to be obsessive- willing to repeat a recipe with slight variations until the texture comes out just right. Over the last few weeks, I have been testing and re-testing a superbly easy recipe, with trays of Glutinous Rice, with different ingredients and sauces, with the intent of producing a rice dish that is smooth in each grain and yet not sticky, hard or mushy. The ingredients are all quite similar- dried shrimp, shallots, Chinese sausage (lup cheong), canned braised peanuts and so forth. My grandmother's recipe included shallots, dried shrimp, Chinese sausage, dried scallops, peanuts, mushrooms and Chinese chestnuts, so that is what I tried first (in the foreground). For the second dish, I was more restrained and added only the shallots and dried shrimp (must-haves) and then just the dried scallops, Chinese chestnuts and fresh pork strips. This wound up having a lighter and sweeter taste, which scored the top marks in my test groups for it's clarity and purity. (The third dish was a mix of the ingredients, but with the Chinese sausage diced finely, as to not be overpowering in taste and oiliness). 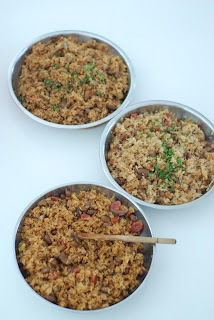 From my experience, I have a few tips to share in making a good glutinous rice. The first debate is whether you should soak the glutinous rice. In each of the times that I made this dish, the longest I soaked the rice was for 2 hours and I felt it produced a slightly wet rice. I now wash the rice thrice, but I do not soak the rice. I also try to buy rice from when I am in Thailand- although most of the glutinous rice in Singapore is ostensibly Thai rice, I find there is a huge difference and the quality of the rice brought back from Thailand is invariably sturdier, cleaner and shorter-grain. You should also soak the Chinese Sausage in boiling water and then in iced water, to remove the intestinal wrapper skin of the sausage (it is truly quite disgusting when this chewy material is left on) and the dried scallops, which then need to be shredded into thin pieces. Second, most of the dish is actually in preparation, or slicing all the ingredients, as the assembly is relatively quick. In particularly, you should thinly slice the shallots and the dried shrimp, as how well they are incorporated makes a big difference to the overall taste of the rice. For my last batch, instead of chopping them by hand, I literally ground the dried shrimp into a light, airy spun sugar-like fluff, in my spice and nut grinder and I find that imparted an almost invisible savouriness to the rice. I also like to use good quality dried mushrooms, then soak and braise them in a mixture of shaoxing wine, soya sauce and oyster sauce, then slice them thinly. You don't have to go through this extra step and can use fresh shitake mushrooms but I find the dried mushrooms to be more fragrant and turgid. In order of frying, add a splash of oil into a non-stick saucepan and heat. Each of the pans above is 400 grams of glutinous rice, if you are making a small pan, 200 grams will do. I usually make 400 grams each time, so that I have some to eat at home and some to give away. If you are making a 400 gram portion, you should use about 4 Tbsp of oil. When the oil is hot, add 1.5 Tbsp of finely minced garlic and 1/3 cups of finely sliced shallots. Fry until slightly wilted and add 1/2 cups of finely ground dried shrimp and continue to fry until all the ingredients are soft. I then add all the ingredients, which are approximate measures, I usually use about 1/3 cup of each but you can add more if you desire. If you are using more variety, then of course, you can use less of each. The last ingredient you add, is the rice, followed by just enough stock to wet the rice. The liquid added has to be less than the volume of the rice, if the liquid level is over the rice, the rice will wind up being too wet, or it will boil instead of steaming, causing it to become mushy. I use a stock that is 2/3 boiled chicken soup and 1/3 water but you can use canned chicken stock or more water if it's convenient. Fry the rice until all the liquid disappears and the rice is dry. This is the most important step in the process and it's important to do it quickly, over a fairly large flame and turn the rice over frequently, so that the drying process is even and quick. The rice should essentially be more than half cooked at this point, although you may still see white bits that haven't cooked thouroughly. Add white pepper, light soya sauce and dark soya sauce to season and for colour. I add about 4 tsp of white pepper, a pinch of salt, 2 tsp of light soya sauce and 1 Tbsp of dark soya sauce. I'm fairly liberal with the white pepper and salt- you want to add enough salt, as the rice can be flat or tasteless otherwise. Prepare a steamer and steam the rice for another 15 minutes, turning after the first 10 minutes and returning to steam for another 5-10 minutes. You can bury some spring onion pieces in the rice while steaming. Fluff the rice when you remove it from the steamer and let cool, gradually. This glutinous rice, or 'luo mi fan' makes a good base for a meal, or else for the filling in Teochew kueh (they are wrapped with a pink glutinous rice flour wrapper and banged into a mould shape, then pan-fried. You can also wrap the rice with a nice fat piece of chicken thigh, in a dried lotus leaf, tie it up and steam it to make the Cantonese 'lo mai kai'. We have a few recipes to share for Chinese New Year, a really busy and communal time of year for us in Singapore and around parts of Asia. There are many traditional cakes and cookies that are served over the festive period and I've noticed, many that incorporate nuts like peanuts, almonds, walnuts and sesame. This recipe is a really simple one and easy to put together, you can also replace the peanut with ground walnuts to make "hap tou sou" or walnut cookies. It was also easy to shape, perfect to do with kids and they look really pretty! Mix the ground peanut, sugar, oil, butter and flour together till well combined. I used my mixer but this recipe can also be done by hand. Shape into small balls and then press flat, using a fork or the palm of your hand. You could also add a circle pattern on top by pressing in with a toothpaste cap or the larger round opening of a piping tip. Brush on the egg yolk glaze and bake for 20 minutes (or until brown) at 350 F or 180 C. Remove from the oven and let cool completely before placing in Chinese New Year jars.